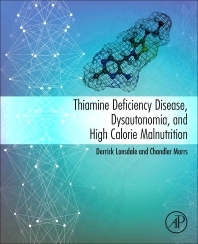 Thiamine Deficiency Disease, Dysautonomia, and High Calorie Malnutrition explores thiamine and how its deficiency affects the functions of the brainstem and autonomic nervous system by way of metabolic changes at the level of the mitochondria. Thiamine deficiency derails mitochondrial oxidative metabolism and gives rise to the classic disease of beriberi that, in its early stages, can be considered the prototype for a set of disorders that we now recognize as dysautonomia. This book represents the life’s work of the senior author, Dr. Derrick Lonsdale, and a recent collaboration with his co-author Dr. Chandler Marrs. Dr. Lonsdale was educated in England, graduating from London University with the degree MB BS. After National Service in the RAF as a medical officer he became a family physician under the National Health Service. He immigrated to Canada in 1957 and in 1960 he was accepted as a pediatric resident at Cleveland Clinic, Cleveland, Ohio. In 1962 he was appointed to the pediatric staff where his clinical research led to his commitment to uncovering the connections between thiamin metabolism and metabolic brain disease. Before retirement he was a Fellow of the American College of nutrition and a Certified Nutrition Specialist. Dr. Marrs received a BA in philosophy and then spent many years in the tech industry before returning to academia for an MS in Clinical Psychology and an MA and PhD in Experimental Psychology with an emphasis in neuroendocrinology. Recognizing the lack of women’s health and hormone research, Dr. Marrs founded Lucine Health Sciences, a health research and media company that publishes the online journal Hormones Matter and conducts post-market, direct-to-patient medication safety and efficacy studies.